These “good girls” could be in trouble — and not just on their show. Their NBC TV show hasn’t been doing very well in the ratings and the show could be cancelled. Would you watch a second season of this Monday night series? 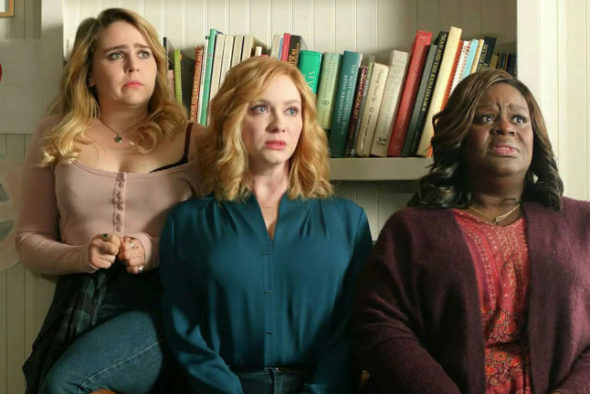 A dark NBC comedy-drama, Good Girls stars Christina Hendricks, Retta, Mae Whitman, Matthew Lillard, Reno Wilson, Manny Montana, Lidya Jewett, Izzy Stannard, and David Hornsby. The TV series centers on three suburban mothers who have been struggling to get by. After a series of setbacks leaves them desperate, they decide to hold up the local Fine & Frugal supermarket, but their take far exceeds their expectations. Soon, they’re in deep with the local crime boss, and these “good girls” find themselves with an array of bad choices. The Good Girls series debuted in February and, thanks to having the season debut of The Voice as its lead-in, the premiere attracted a 1.50 rating in the 18-49 demographic with 5.98 million viewers. The second episode saw a dip of more than 10% and episode three dropped a lot lower. The numbers have evened off and recent episodes of Good Girls have averaged about a 0.90 in the demo with about four million viewers. In today’s television landscape, those aren’t awful Live+Same Day ratings for a 10pm series on NBC. However, Good Girls typically loses about half the audience of its lead-in, The Voice. It’s unclear if the NBC execs will be satisfied with that kind of retention or, if they feel like they could do better with another show. Last year, Timeless drew similar ratings in the same timeslot and was cancelled. NBC reversed that decision when fans created an uproar but, clearly, this level of numbers will leave a show on unsteady ground. On the positive side, Netflix picked up the international rights for this show in December 2017. A similar deal helped land The CW’s low-rated Dynasty series a second season order and it could be enough to save Good Girls as well. We’ll likely know if there will be a second season of Good Girls by May 14th, when NBC announces their plans for the 2018-19 season. What do you think? Do you like the Good Girls TV show? Would you like to see it renewed for a second season? Should it be cancelled instead? 5/7/18 update: NBC has renewed Good Girls for a second season. Details here. I’m addicted to this show! PLEASE renew it ! I want more seasonS! Love this show!! I even got my husband watching. Please renew for next season!! Yes, all of that; familiar plot, writers need to step up and add a little more believability, etc., but I love it anyway! It’s entertaining, the cast more than works and we want to see these women win! All I’m saying is, you can tell who cast this show. Of course the story and events are hard to believe, but the excellent cast more that compensates for that. My wife and I love the show. We’re hoping for a second season. I think it’s a good show. Not my favorite by any means, but it’s good. The storyline is getting old though and very predictable. The premise was ok but very unbelievable. The writers need to step it up big time- the characters are fine- but the storyline is tired. I love this show. I feel sorry for anyone who didn’t stick with this show. It is awesome! Please don’t cancel it! Love the show and think it should be given a chance! A lot of very successful shows were slow starters took off later, making them worth the wait. Also: Are they counting Tevo/recorded shows? I am in love with this show! There is no way they can cancel it! typical white girl love interest. Like they’re gonna can put them two together. already knew the “fandom” was rooting for that to happen. Any love interest i want hardly every happens cuz it’s not typical on TV/movies. why would that Rio character won’t her and her kids..think he wants to be their daddy..no. He doesn’t seem in love with her. No. They don’t belong together. That said, the actors (Chrisrina and Manny) have a great energy in their shared scenes that’s very compelling. After the big cancer lie was revealed, though, I could see Beth pointing that gun at her husband and giving an “even after I got Rio arrested by the FBI, he still treats me with more honesty and respect than you ever have … so why shouldn’t I pull this trigger?” speech. Manny was more believable as a gay guy on Conviction than as a crimelord on Good Girls. And there are no bullets in the gun Beth is holding. It’s so obvious.